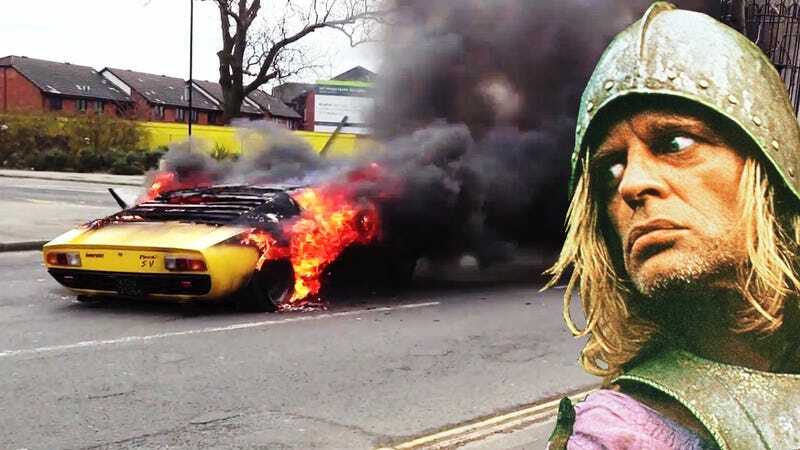 Why is it that my favorite cars always catch on fire? Maybe there's a presence on high that hates 'em. Today we all saw that flooding in Germany killed a 2014 Jaguar F-Type, and it was too much for ATX211. I have just come to a realization. God appears to hate cars. Perhaps it is not as simple as that, and maybe it is just the he is angry we get all of the cool toys. But seriously, think about it. He has torched two entire trailers full of high end vehicles in the last year. He started a bunch of fires in New York with Water, of all things, and on cars named Karma (Sandy/Battery fires). Germany, a place rich with fine vehicles, flooded, and we are probably just seeing the tip of trashed vehicles. And let's not even get into Ferrari's and Lambo's (Dude). He Smites those things with a frequency and fervor matched only by that of a child who has just discovered magnifying glasses, and fire ants. And those are really just the most obvious, and/or recent things I can think of, or have read here. And of course the worst injustice laid upon vehicles the world over is the asshatted buffoonery of those capable of owning them, but without the ability to drive their way out of a paper bag, in a rain storm, with instructions. Do you think there's evidence to prove that there's a divine entity that hates fine automobiles?